Kidney bean is a type of common bean shaped like a kidney giving it its name. Kidney beans are used in many cuisines worldwide, most particularly in northern Indian cuisine. It is great idea to introduce kidney beans into your diet because of their wonderful taste, versatility and their many health benefits. Rajma is the name of this pulse in Hindi and it's also called red kidney beans. 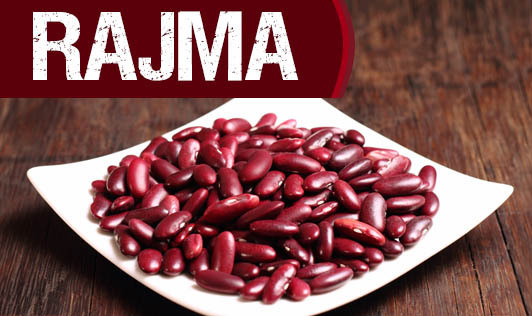 100 grams of rajma contain 22.9g of protein, 1.3 g of fat and 3.2 g of minerals. It is a good source of calcium, phosphorus, iron and fibre. The nutrient profile of kidney beans is impressive. It is packed with protein making it a great meat substitute for vegetarians. It has plenty of fibre, both soluble and insoluble. It contains essential minerals in high quantities like magnesium, potassium, manganese, zinc and iron. It also is rich source of vitamins like folate or vitamin B9 and K. Additionally it is low in fat content and contains only a moderate amount of calories. Kidney beans act a cancer preventive food due to its manganese and vitamin K content both of which act as antioxidants hence reducing oxidative stress that is implicated in many cancers. Kidney beans lower cholesterol and homocysteine. This is due to the magnesium present in them. They also help lower blood pressure. This in turn promotes cardiovascular health. They are good for your nervous system as a whole. Vitamin K is an essential vitamin required for the normal formation of nerve cells. Kidney beans also provide thiamine that helps in the synthesis of acetylcholine needed for cognitive function. Kidney beans can help regulate sugar levels reducing the risk of diabetes type II. It can remove sulfites, which are added as a preservative in many foods by virtue of its detoxifying qualities. It helps maintain digestive health by preventing and relieving constipation due to its high content of fibre. Kidney beans are an excellent source of energy with a nutritional profile that is low on fats and high in protein and also a source of essential nutrients. They contain a high level of iron which is essential for formation and efficient working of red blood cells. This prevents anaemia and related problems. Kidney beans are an excellent source of protein. They contain eight essential amino acids. Protein is required for the normal functioning of all body systems. The antioxidants and other nutrients present in kidney beans help to boost the immune systemhelping the body prevent and fight infections. They are a rich source of manganese, calcium and folate all of which are essential for bone health. Eating kidney beans may help keep bone diseases like osteoporosis at bay. Kidney beans are chockful of flavonoids. Along with that, their zinc content helps keep your skinhealthy by reducing blemishes and wrinkles. It can prevent premature ageing of skin by providing the body with antioxidants. Kidney beans are also good for eye health. The zinc and niacin content promote healthy eye cells and retinal cells while reducing the risk of cataracts. The biotin content of kidney beans is essential for healthy nails and hair. As a food rich in fibre and protein but low in fats, they make an excellent dietary addition to those wanting to lose weight. Kidney beans contain a large amount of folate which in addition to other benefits also helps withmigraines. The zinc in kidney beans help with tissue regrowth and healing after injury. Kidney beans are an excellent food for pregnant women due their ability to provide with you with iron, amino acids, and folate all of which have been shown to reduce complication and birth defects.